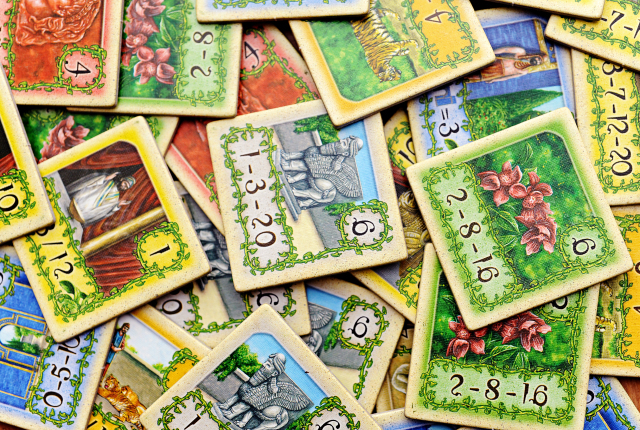 In The Hanging Gardens you play landscapers, each vying for the right to design the fabled Hanging Gardens of Babylon (that’s where they got the name). Each player will be creating their own layout and the one that is able to score the most from their design will win the competition and the game. 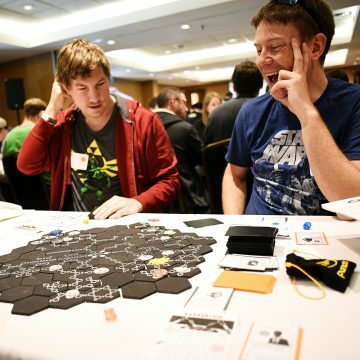 HG is a simple, beautiful tile laying game that relies on a bit of planning and a bit of luck! Each player starts with blank building card divided into six spaces and five temples to score with. Each round 3-4 cards are up for grabs. The cards are made up of a combination of blank spaces or different building styles. The building styles come in four different motives: terraces (red), parks (green), arcades (yellow) and fountains (blue). The motives can be used to create grouping of the same colour to score out points. Once a grouping of three or more is made you can score that section by placing one of your temples on one of the group motives. Scoring out a section allows you to grab a building tile from the display. There are always six tiles face up for grabs in three different columns. The bigger the section you score out the more options you’ll have with selecting scoring tiles. Each tile is going to be worth a certain amount of points depending on how rare they are and how many you’ve collected. The value of the set is determined by how many you have. For example the Statue tiles are worth only one point if you have only one of them, three if you’ve collected a second and twenty if you have a full set of three. There are six Statues in the game, so it’s possible for two players to get a complete set. A single Queen is worth one, but a second jumps the value to fifteen. There are also five Person tiles that are related to the other scoring tiles. The Person tiles will be worth a certain value on their own and a higher value if you have a complete set of the tiles they are related to. The Animal Handler is worth three points on his own, but ten if you have a complete set of Tigers. Scoring a grouping of three will give the option of the first two of the face-up scoring tiles. Larger groupings unlock the other available tiles. 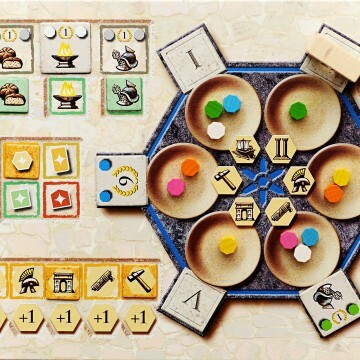 A grouping of six or more allows you draw a tile from the top of the scoring tile pile as well as your pick from the board. Not everyone will be going after the same sets, so the value of the individual tiles will vary from player to player. Further complicating the value assessment is the fact that although the frequency of the scoring tiles is common knowledge, rarely do all the tiles actually become available. Game end is usually triggered by running out of building cards. Placement of cards and temples is pretty important in this game. 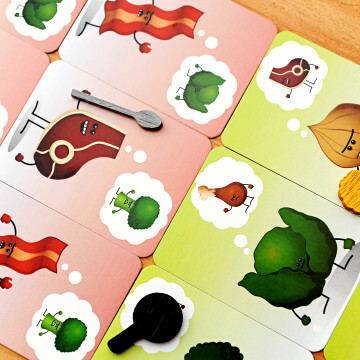 New cards added to your design must not cover any temple, nor place a motive flat on the table. All motives must either land on a blank space or another motive. This can be tricky when trying to manoeuvre cards into position for scoring big sets. Once all five of your temples have been placed you can move them when you want to score again. You always relocate the temple on the spot with the smallest grouping. The decisions of where to place a temple or card can come back to haunt you later in the game, so choose wisely. 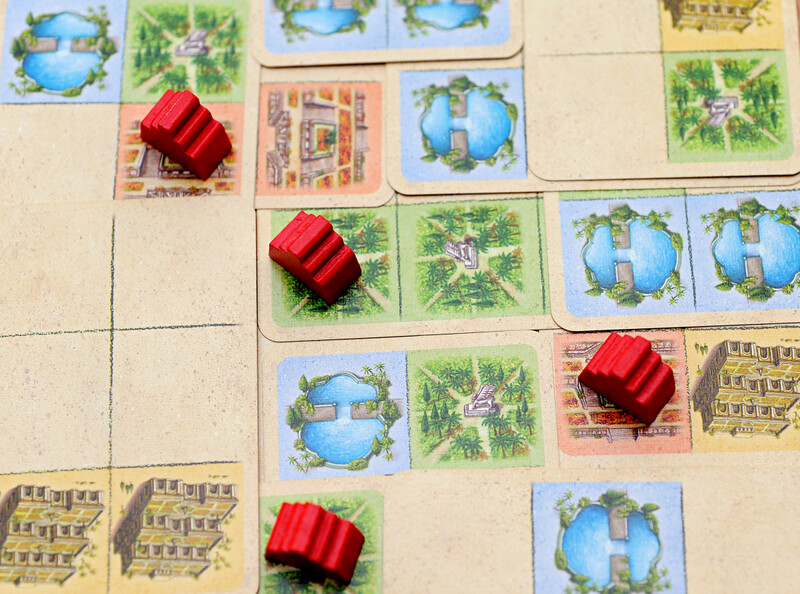 On its surface The Hanging Gardens is a typical tile laying game. It’s the scoring system that really makes it interesting. Choosing a scoring tile is often taking a risk that you’ll see enough of those tiles through the course of the game. Great write-up of one of my Top 10 games of all time. Cool! Thanks for that perspective. Interesting to hear about its debut back in 2004. I’m also glad you like the game too. Hanging Gardens is definitely one of my favs!